Constable Matt McDonald got caught in the middle of an attempted bank robbery just two days before the Christmas holidays. 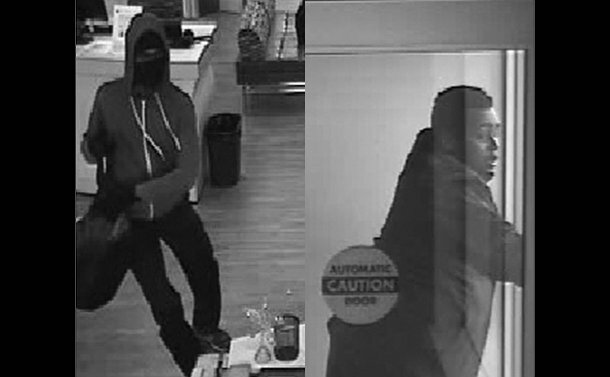 The 13 Division Major Crime Unit officer was a customer in an Oakville bank when two masked suspects barged into the Royal Bank branch (2501 Third Line) in Oakville before 11 a.m. on Dec. 23. Taking a quick glance at the weapons, McDonald – who joined the Service in 2001 – concluded they were fake. One of them fled the bank while McDonald tried to subdue the other. In the ensuing scuffle, the officer broke a bone in his right hand. “I did it when I hit him… once the hand started to swell, I was unable to grip him properly,” he said. McDonald managed to pull the mask off the suspect before the man escaped without a shoe. No money was taken from the bank. Male, black, 5'10"– 6', 25 – 30 years old, approximately 200 pounds, wearing a black knee-length jacket, black balaclava, black gloves, beige pants and brandishing a black handgun. Male, black, 6', 25 – 30 years old, slim build, approximately 160 pounds, clean shaven, wearing a grey hoodie, black balaclava, black gloves, black running shoes and carrying a black duffle bag. Anyone with information should contact Halton Regional Police Service Detective Constable Peter Galopoulos at 905-825-4747, ext 2274 or Halton Crime Stoppers at Crime Stoppers at 1-800-222-TIPS (8477).